Mamarizo Nurmuratov: Uzbekistan’s Unsung Hero? The implementation of serious aspects of Mirziyoyev’s economic reforms have fallen to the central bank governor. In his two and a half years in Uzbekistan’s top job, President Shavkat Mirziyoyev has been praised for his wide-ranging economic and political reforms, including efforts to end cotton slavery, open the country for tourism, and re-establish ties with neighboring countries. Last month, the country took another leap forward by entering global capital markets, with the sale of its five and 10 year Eurobonds. Although Mirziyoyev deserves much of the credit he has received, perhaps the unsung hero of Uzbekistan’s rise has been its little known central bank governor, Mamarizo Nurmuratov. Previously serving as chairman of the Senate Committee on Budget and Economic Reforms as well as the country’s finance minister, Nurmuratov was appointed to the central bank governor post in June 2017. After Uzbekistan’s upper chamber of parliament selected him, capital instantly began to flow into the country. Barely six months into his term, the EBRD re-opened an office in Tashkent and made its first loans to Uzbek entities in well over a decade. His tenure has also seen Tashkent secure funding from the World Bank, the International Finance Corporation, the Asian Development Bank, the Asian Infrastructure Investment Bank, and the Silk Road Fund. Capital from East Asia and Europe has cascaded in response to the country’s reformist economic agenda, which in itself was driven by a Nurmuratov-managed, monetary policy shift. The most significant change came in early September 2017, when the government modernized Uzbekistan’s foreign exchange market and removed the som’s peg to the U.S. dollar. On that day — September 5th 2017 — the som plunged in value by 48 percent. Although the original decree was issued by the Uzbek President, Nurmuratov was the one left to stabilize the currency. Since then, the som has appreciated and the central bank has intervened from time to time, if only to ease temporary volatility. Recognizing its positive economic trajectory and solid monetary position, credit rating agencies awarded Uzbekistan a BB-/B1 — an unusually high score for a first time issuer. Yet the market was even more bullish still: Uzbekistan’s original debt offering was oversubscribed by seven times despite relatively low yields. Investor confidence in the newly opened country reflects a tacit respect that asset managers have for Nurmuratov — or at least an expectation that he will keep the economy on a positive trajectory over the medium term. In March 2018, the Central Bank announced an inflation-targeting economic policy framework. 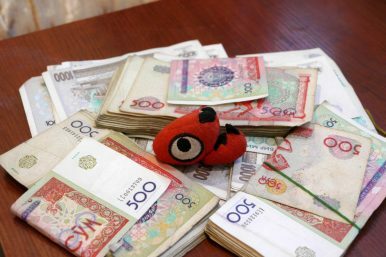 High inflation remains a major challenge to Mirziyoyev’s currency reforms: inflation hit 17.9 percent in 2018 due to utility price adjustments, public sector wage increases, a weak som, and rapid domestic growth. However, analysts expect that number to drop back to 16.8 percent in 2019 and 14 percent in 2020. The IMF is wary of Uzbekistan’s “relatively high inflation rate,” which stands between 15 and 16 percent. But it also acknowledges that a country in the early stages of market development will inevitably face sub-optimal rates of inflation. By comparison, most post-Soviet neighbors fared much worse in their reform programs. Georgia’s inflation hit 160 percent in 1995, Russia’s was still over 45 percent in 1996, and Ukraine suffered chronic hyperinflation for half a decade after independence. Nurmuratov, meanwhile, is in discussions with the IMF to secure additional assistance, which could help reduce inflation to a more manageable 13.5 percent. Nurmuratov still faces several challenges ahead. On the one hand, the central bank has a limited influence over domestic monetary credit conditions; only 20 percent of som-based credit is subject to market-rates, or “commercial” terms. As the central bank continues to transition towards inflation-targeting, Nurmuratov will need to address the high rate of credit segmentation in som-based lending. Furthermore, the central bank must provide more tools for regulating and influencing monetary policy in the face of rising inflation. As of now, the central bank has indicated its willingness to regulate excessive liquidity by altering the banking reserve ratio. However, it remains to be seen how much of an impact altering said ratio will have. Despite the reform drive, Uzbekistan remains a black box. Few outsiders know who holds the levers of power besides Mirziyoyev. But it cannot be ignored that the country’s central bank policy has been steady, and helped to attract significant foreign investment since Nurmuratov’s ascension. The institution, if not its leader, deserves some credit. Peter Simon is the co-founder of ssuinsight.com. He received his BA from Cornell University and his Masters from the University of Oxford. You can find him on twitter @Petersimon419. Mirziyoyev’s first trip to Europe was dominated by the search for investment in France.